I have written before about how broadband actually got slower in Australia in 2011. Julia Gillard held a digital forum this week and there’s also an article in the SMH today about how Australia should have a tech boom instead of a mining boom. 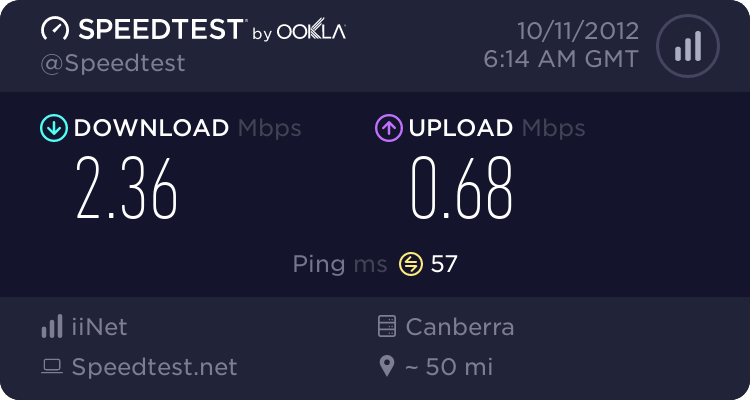 A basic is, of course, connectivity and the speed of broadband – I am so bored of being told that Australia is a ‘special case’ when we only just beat Mexico and Morocco – they have more of a special case than us. They’ll be no tech boom when we pay $79 per month here for iiNet broadband which is today running at 2.36 Mpbs down and 0.68 Mps up. In the UK, Virgin can supply 100Mbs up and down for about £19 per month and BT can supply 50Mbs for £14 per month. So the UK has a massive speed and cost advantage over Australian tech businesses. Rating: Terrible – Only one eighth of the theoretical maximum speed – we are 500m from Martin Place in Sydney – how can this be?